In May 2014, a fieldwork trip in a small village in the Eastern Ujimchin banner of Inner Mongolia revealed concerns of thelocal herders regarding the quality of their well water which they thought may be polluted by nearby industrial wastewater. In mid 2015, Dr Uchirit began to plan and implement an action research project to explore the quality of the well water. One of the main strategies in this project is to address villagers’ concerns by connecting local herders with professional scientists and let them interact to discover which wells have problems and identify the nature of these problems. The basic idea of this action research project is similar to other established models of Public Participation in Scientific Research Project. Wuqiriletu (Uchralt) has released a short documen - tary film online titled ‘Well Water Testing: Public Participation in Scientific Research’, produced out of his fieldwork in Inner Mongolia and Japan. The video segment can be found at Survival Politics. Many of the widespread diseases in humans are contracted through contact with other animals, particularly those living in close proximity with humans. In the western medical tradition, treating animals through veterinary care has been quite separate from human medical care, indicative of the epistemological divide between nature and culture. There is, however, growing recognition of the need for a ‘One Health’ approach, accepting that disease and illness readily cross the species barrier as zoonoses. Combating zoonotic diseases requires the treatment of both humans and animals, a strategy that has been employed within Traditional Mongolian Medicine (TMM) for hundreds, even thousands of years. 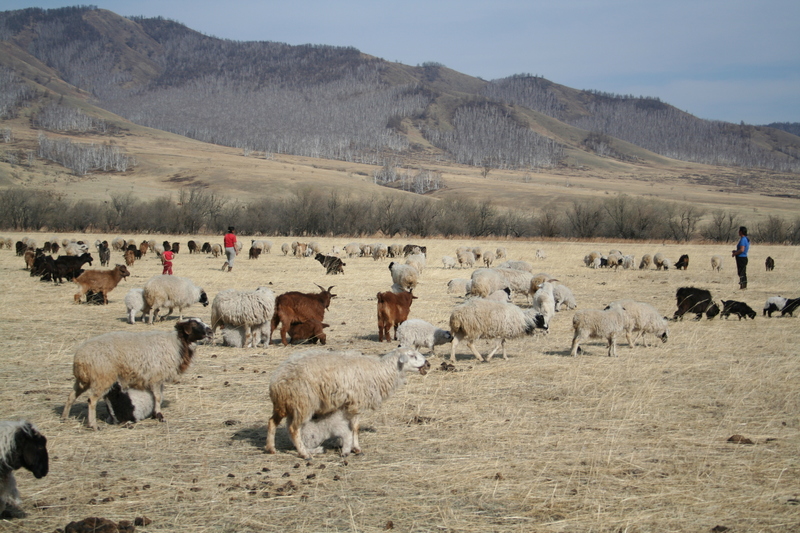 The focus of the project is on the ways in which Mongolian herders use One Health to treat their families and their herd animals, as a means of understanding pastoralist knowledge toward other beings in a changing and increasingly Anthropogenic landscape. Part of a Mongolian herding family’s daily existence is in the treatment of illnesses, of family members and herd animals, using a vast array of techniques and an impressive knowledge of local medicinal plants. Of significance are herders’ ideas about the causation of illness and their subsequent preventative measures. This research is important in retaining some of the wealth of medicinal knowledge that is passed on from one generation of herders to another in Mongolia. Her current project funded by the Economic Research Institute of Mongolia aims to develop a stress-testing model that simulates household loan defaults and losses based on a data from the Household Socio-Economic Survey (HSES) in Mongolia. The model is able to (i) quantify household financial resilience and exposure to shocks, and (ii) estimate the banking sector’s exposure to households that are more likely to default. Comparing to the aggregate data (i.e., the household debt-to-income ratio), household surveys provide more insights into households’ ability to pay as they contain information on the distributions of household debt, assets, and income. Thus, it contributes to the development of a complete stress-testing framework for the Mongolian financial system as the stress testing of household loan portfolio is one important component of the framework. The year 2016 marks the 300th anniversary of two landmarks in the history of Mongolian literature and Chinese philology. It was in January/February of the year 1716 that the Mongolian version of the Tibetan epic of Geser (in Tibetan Gesar) Khan was published in Peking. Igor De Rachewiltz and Li Narangoa have been translating the Mongolian version of this Geser epic, the earliest dated printed Mongolian edition of the epic. This book project examines the national aspirations of Inner Mongols in the first half of the 20th century. It focuses on their engagement with opportunities and threats presented by the Chinese Republic, imperial Japan, the Soviet Union and Mongol movements elsewhere. This project addresses the difficulty faced by International history in conceptualizing unequal relations between sovereign powers. We understand that there are great disparities in power between states, and that these disparities mean that some states are in some respects subordinate to others, but characterizing this subordination remains problematic. Various terms are available to denote sovereign subordination - client, vassal, satellite, puppet, protectorate, tributary, neo-colony, ally - but in general these terms are used loosely, and they often carry judgemental baggage. That is to say, they impugn the claimed reality of the sovereignty or independence of the subordinate state. In this project we explore the character of sovereign subordination by focussing on puppet states. We argue that puppet states can be defined as ostensibly sovereign states which have been created from the sovereign territory of a state by the intervention of a third, external state. One of the key features of a puppet state is that it did not exist as a sovereign state before external intervention. If a previously existing sovereign state is dominated or controlled by an outside power, it may be considered to have a puppet government, but it is not a puppet state. Puppet states characteristically emerge on the border between an old empire and a new one. They invariably appeal to unfulfilled aspirations for national self-determination and they reflect the growing power of the doctrine of national self-determination in international affairs. As part of this project we examine the international politics of the foundation of new states in Mongolia, Tuva, Manchuria and Siberia.